Check out the post over at AutoWeek to see why and how we caved with our latest car minivan purchase. In the article, I mention that we love performance cars, but not which ones. Here's our fleet as it stands now. 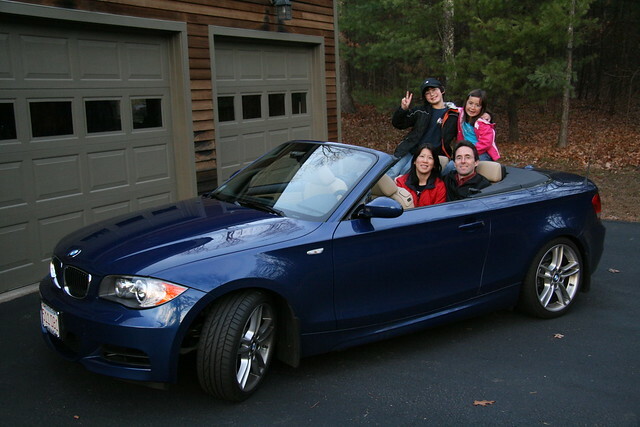 Last year's family portrait in an antithesis of a minivan... my 2009 BMW 135i Convertible with the M sport package. This baby flies at 300 HP. The story of how this car came to be is here. 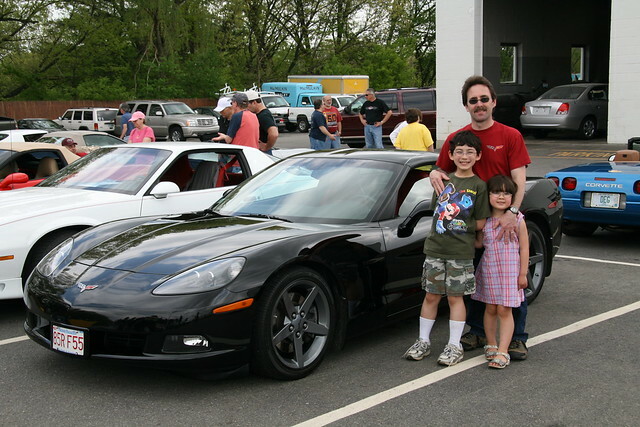 Doug's car is a made-to-order 2006 Corvette with the Z51 performance package. He beats me at 400 HP. Zoom! 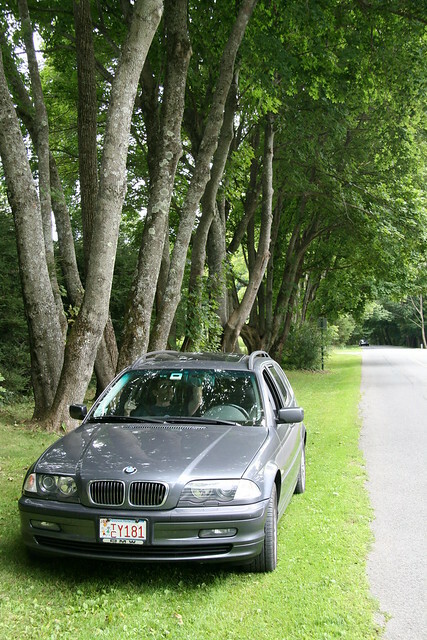 Since my precious rear wheel drive 135i doesn't handle the New England ice and snow (and car-eating salt) very well, I kept my previous car, a 2001 BMW 325xi touring sedan (i.e. wagon), for the winter (and rainy days). This was my daily driver since 2003 and has been quite a trusty workhorse. Not to mention it is quite luxurious and sporty with a sport suspension and manual transmission. Now this is the only car that we have with a 5-speed instead of a 6-speed manual transmission. 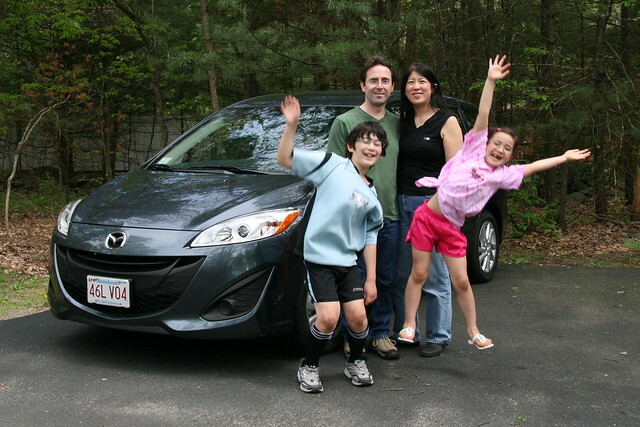 Here's the latest edition, a Mazda5 with a 6-speed manual transmission. How much flak are we gonna get for this family portrait? Beautiful BMWs. We're a BMW family too so excuse me while I drool over that convertible! Makes me wish they would design some SUVs that are 7 seaters! I admit the thought of having a minivan has made me want to stop at two, too! I'm a proud minivan driver! I guess you're right though: we bought our minivan when Baby #2 was less than a year old, and we still only have 2 kids, five years later. The last picture with the jumping kids reminds me of the old Toyota advertising campaign, "Oh what a feeling!"